The most anticipated tour of 2018 is no question the On the Run II Tour. The musical power couple of Jay-Z and Beyoncé will come together in stadiums across North America starting on July 25th in Cleveland, Ohio hitting 24 cities. So as we get ready for another jaw-dropping Beyoncé and Jay-Z tour, we take a look back at the success of the most recent tour to answer the question: Who runs the music world in the Carter household? 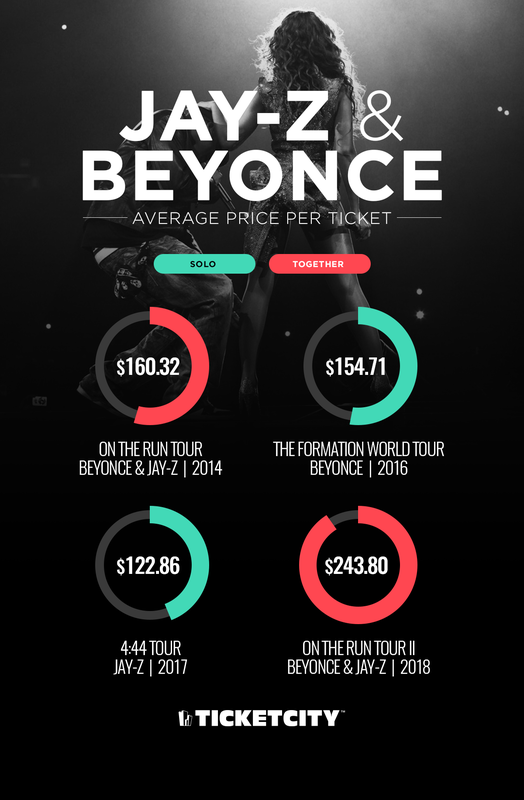 TicketCity compared Jay-Z and Beyoncé’s last solo tours as well as the On the Run tour and the upcoming On the Run II tour with ticket and attendance data to determine whose tour was more successful as well as who boasted higher demand. Beyoncé and Jay-Z came together on the road for their first tour in 2014 for On the Run. They visited 16 cities in North America, where they had an attendance of over 800,000 in total. As the fifth highest grossing tour that year, the average ticket price to get into the show was $160. Beyoncé went on an epic solo tour to support her groundbreaking album, Lemonade in 2016. It has been reported that The Formation Tour was sold out for 49 shows and was ranked as one of the top tours that year with an attendance over 1.3 million. Tickets for the Beyoncé’s 2016 tour had an average price of $155. The most recent solo tour between the duo was Jay-Z’s 4:44 tour for his 13th studio album 4:44. The average ticket price for the 4:44 tour was $123 as it spread over 31 cities in North America. Overall, this tour had the least impact with the lowest ticket average and less than half a million in attendance. The reunion of Jay-Z and Beyoncé their On the Run II tour has proven to be the most in-demand tour for each as a duo and solo. Average ticket prices for the upcoming tour has hit $244 and is expected to drive a record number in attendance to the stadiums. So, who runs the world?? Beyoncé and Jay-Z have proven to be stronger together than they are apart with a ticket average increase for both the On the Run Tour and the On the Run II tour. There is no question that when Jay-Z fans and the BeyHive join nothing can stop them! To see more from TicketCity, visit us here.